There are few things more oxymoronic than ‘fast and French’, especially when referring to food. But Gaulart & Maliclet Café in downtown Charleston delivers on its catch phrase, offering patrons terrific French inspired food in the blink of an eye. No doubt the French would consider such a place an abomination, but then, we never really cared for French service that leaves you to linger over empty plates hours after you’re ready to leave. No risk of that here. Turnover at the communal tables is quick and service is prompt. 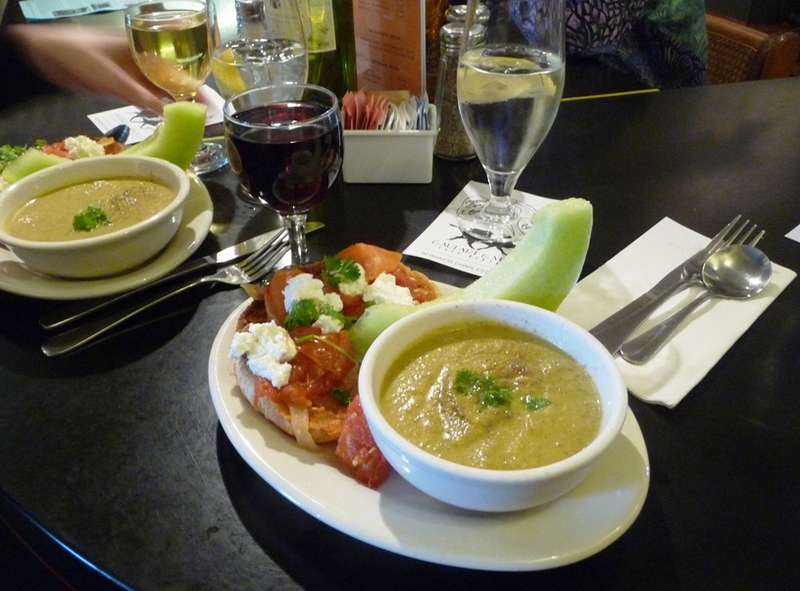 We enjoyed a fresh and fabulous lunch of zucchini-brie soup, melon, a toasted croissant topped with goat cheese and tomato, and a glass of wine (naturally) in about 20 minutes. Far superior to fast food. This is superior food, fast. My idea for fine fast food is a Wendys #6, add onions, with a small chili. Drive through only, so that I can listen to a great Paul Shanklin parody song on the EIB network.